To minimise the maintenance effort of a regularly-changing user interface we must uncouple the user interface from the functionality of the system. We must separate the effects of information flowing into and out of the system – What the information content is and how the system responds to it – from the presentation of that information to the user. The use case description defines the desired requests and responses to the system; the MMI defines how those requests and response are manifested. An event-mapping table can be used to map functions of the MMI (or indeed any interface specification) to the system event (transaction) it invokes or is in response to. Using an event-mapping table de-couples the interface from its function. The mapping table allocates some user interface operation (which could be as simple as a drop-list selection, or as complex as a whole sequence of button pushes or mouse clicks) onto a system behaviour. Doing this separation also alleviates that all-to-common problem of poorly-written requirement specifications: the User Interface Specification contains half the functional behaviour of the system; and the System Requirements Specification contains half the user interface detail! This entry was posted in Design Issues, General. Bookmark the permalink. I like your blog. Very useful. Thanks for sharing tips. 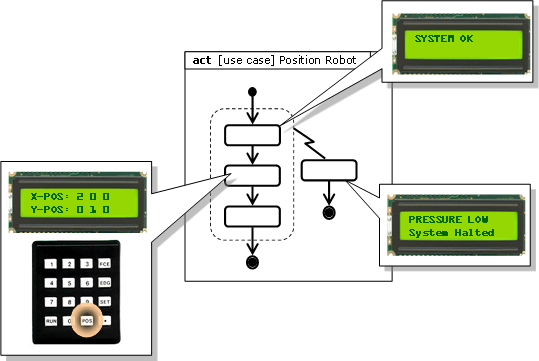 Can you share what tools you use for generating these diagrams or figures and what tools you use for use-case/UML? I have not seen all other rules but I hope there is a DON'T rule which advises AGAINST going too deep into the system and its internal operations or HOW the system generates the responses. There is no need to work on "Sequence Diagrams" while describing Use Case Dialog. That can be done in different ways after completing the use case description. At times it may be necessary to refine the Use Case Description after developing the Sequence Diagram.